The church dates from the 11th century onwards, and consists of a western tower, nave with clerestory, north and south aisles and chancel. The tower is of three stages with a 16th century window to the Belfry. The chancel has an east window with parts of work from the 13th century; the rest is a restoration. The south aisle has a large 15th century window, and the south doorway is a restored 14th century opening. There is an external embattled parapet and clerestory. The north and south arcades have three bays, dating from the 13th century, with octagonal pillars. The tower arch is Romanesque. In the south aisle there is an aumbry and piscina. The chancel arch is early 13th century with 19th-century label stops. The chancel floor was raised in the 19th century during restoration. Most of the fittings are 19th century apart from a 15th century font with octagonal bowl,the upper part is decorated with battlements. The chancel contains a brass plate to the children of Sir John Wray of Wharton. 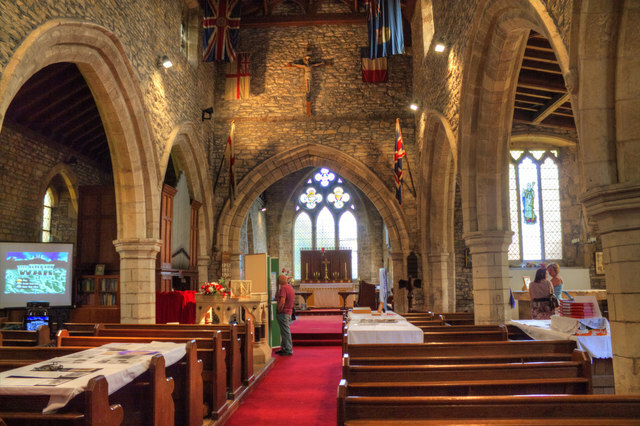 The church contains several flags of the allies from the First World War. There is a window by Kemp depicting Bishop Edward King.